It can be a chore to clean the dutch oven after cooking this item. Pour sesame seeds into dutch oven and stir until golden brown, about 5 minutes. Remove dutch oven from heat and let cool about 5 minutes. Remove sesame seeds to a small bowl. Pour water into dutch oven. Heat dutch oven on coals to about 225 degrees for Simmering. Add rice, cover, and cook for 15 minutes, until soft. Remove rice to a large bowl. Chop onion, carrots, and scallions. Melt butter in dutch oven and add vegetables. Saute until carrots are soft. Crack eggs into bowl containing rice and mix well. 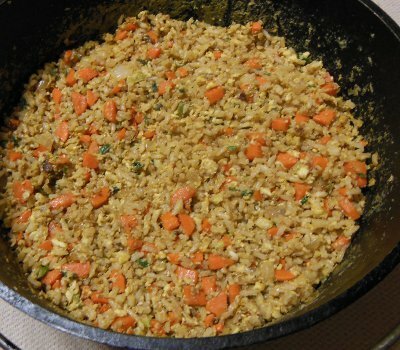 Pour egg/rice mixture into dutch oven with vegetables and mix together. Cook as if it were scrambled eggs, stirring constantly. When nearly done and more dry than wet, mix in sesame seeds and soy sauce, stirring well. Let me know how you enjoyed your Fried Rice!